Raymond Michael (Mickey) McGuire, 92, passed away at home early on November 22, 2018. Mickey grew up in Portlock Virginia, a small suburb of Chesapeake, with his father (Bud) and his mother (Babe), who both worked for the railroad; his Uncle Frank, who worked in the Norfolk shipyard; and his beloved sister Betty. Mickey’s beautiful singing voice was apparent at an early age and his Uncle Frank would often take him around the neighborhood to sing for people. After graduating from Portlock High School in 1945, he joined the U.S. Merchant Marines and was immediately sent to the Pacific to bring troops home at the end of WWII. He was later drafted into the U.S. Marine Corps during the Korean War. As a Marine he was stationed at Camp Lejeune and Camp Pendleton and was active in the Marine Corps Chorus. His choral director often found special performance opportunities for him including a 1953 appearance on the Ted Mack Amateur Hour on NBC. After completing his military service, Mickey attended the College of William & Mary where he earned a BA in Music. As a professional opera singer, he sang lyric tenor roles with Grass Roots Opera, a touring company out of Raleigh, NC. During the 1950’s, Mickey performed with Frank Sinatra, and with Central Park’s Opera in the Park, and was a member of the Men’s Glee Club of Radio City Music Hall. He then joined his lifelong friends Jimmy Ackels and Mike Cordovana at the newly-established School of Music at Catholic University (CUA) under the leadership of John Paul. Mickey earned his MM from CUA’s School of Music and performed in several operas including Pagliacci, Cosi Fan Tutte, the Decorator (a one-hour modern opera broadcast on NBC), as well as soloist performances with the CUA Chorus and Orchestra at Carnegie Hall. 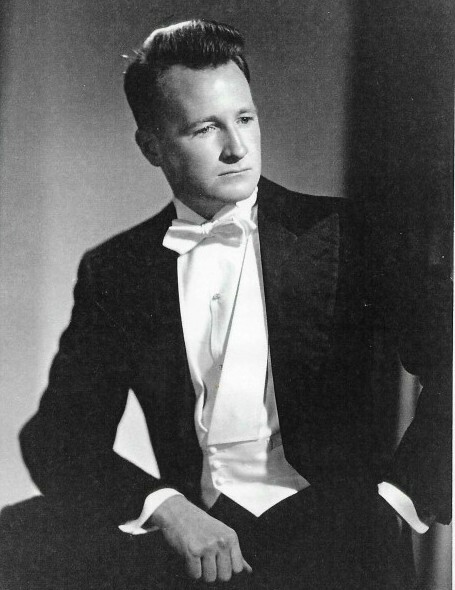 In 1953 and 1954, as the award recipient of the National Catholic Music Educators Association competition, he spent two summers studying at the Aspen Institute. It was there he met the world-renowned soprano Phyllis Curtin who he continued to study under; they remained friends well into later life. Mickey continued his singing career through the early 1970’s, including being a member of the Washington Music Quartet which toured nationally, and maintained a strong, unmistakable voice into his 90s. Mickey joined the CUA faculty prior to 1960 and served as an Associate Professor of Music for over 45 years teaching vocal pedagogy, and numerous courses related to operatic performance, including French, German, and Italian diction and vocal anatomy. Teaching was Mickey’s true life’s work and he had a unique approach. Former students, when defining his lasting impression, often describe him as more of a life teacher than just a voice teacher, a genius, the one and only. In 2001 he retired from CUA to work with students in his private studio and, even in his later years, continued to influence his students many of whom would come to sing for him, the last time only weeks before his death. Outside of the classroom, Mickey was an avid boater and home chef. He spent a good portion of each week sitting on his docked boat reading the paper; and hosted dinner parties and home recitals for students. Even more than singing, his boat, or cooking, Mickey loved his family and friends. Mickey is survived by his wife Mary Ann (nee Cashman) of Annapolis, sons Raymond Matthew and Thomas Francis, of Takoma Park, daughters Moira Grace (Elias Korme) and Margaret Shelley (Joshua Drewitz) of Severn; ten grandchildren (Matthew Christopher Aguilar, Tara Ariana Wilson (Martino), Brett Christian McGuire Reid, Skylar Jean McGuire Reid, Zakariya Owen Korme, Ayisha Dorren Korme, Adam Elias Korme, Maryam Grace Korme, Eleanor Elizabeth Drewitz and Michael Casey Drewitz); four great-grandchildren (Isaiah Michael Wilson, Natalie Esperanza Aguilar, Kai Christian Reid and Ariana Marie Wilson); brothers-in-law Thomas Joseph Cashman (Jacquie) and Edward Etheridge; nieces Carolyn Jean Aunchman (Chuck), Thomas Edward Etheridge (Andrea), Brigid Jayne Nourie (Cary), Daniel Francis Etheridge (Pam), Thomas Francis Cashman, John Todd Cashman, Brendan Eugene Cashman (Danielle), and Meghan Grace Cashman; and countless colleagues and friends -- too many to mention. He was predeceased by his father Raymond J. McGuire of Bayonne, NJ and mother Margaret Shelley of Savannah, GA; his sister Elizabeth (Betty) Etheridge of Virginia Beach, VA; and best friends Michael Cordovana, Jack Murphy, and Jimmy Ackels.